Taps is the twin brother of Chapter Commander Strider — they were born two minutes apart. He was also an original member of the Baltimore Guardian Angels in the 1980s and returned in 2006 to help rebuild the chapter that we all serve today. Taps is responsible for taking the experiences of the past and using them to update the training of the future. 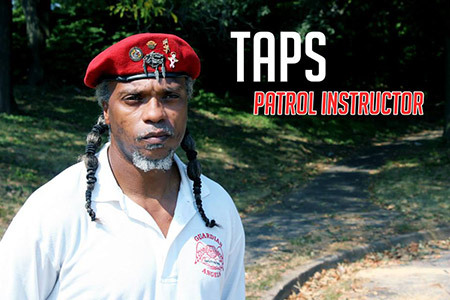 You're not likely to catch Taps in Media Clips or community meetings: his job lead is to lead and train an Angel-only patrol through areas with a higher level of crime. When it comes to making a difference on the street, creating a strong public appearance & teaching Angel tactics, Taps works over time. For the last 27 years, Taps has traveled and worked in the environment/industrial field, water-blasting and decontaminating hazmat sites, but always returns to Baltimore and volunteers his time as an Angel. Taps has one daughter and lives in Baltimore County, where enjoys riding motorcycles and practicing martial arts. “There are no unimportant jobs, no unimportant people, no unimportant acts of kindness.”—H. Jackson Brown, Jr.